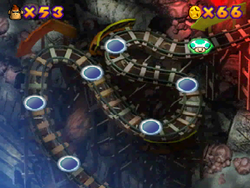 The Mini-Game Coaster is a feature in the Mini-Game Land of Mario Party 2. 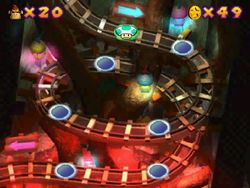 Although the setting is different with some additional features, the concept is identical to Mini-Game Island from Mario Party. 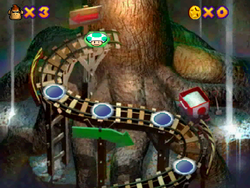 To unlock the Mini-Game Coaster, the player has to buy all of the 4-player, 2-vs-2, and 1-vs-3 minigames from Woody. The player picks out their own character, as well as the partner for the 2-vs-2 minigames (the partner will also appear in 1-vs-3 minigames whenever the human player is part of the team of three). The objective is to reach the Goal. The player starts with four lives. Each time the player loses a minigame, they lose a life. 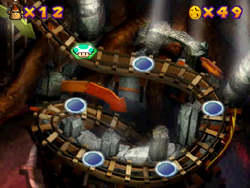 After obtaining 100 coins, the player gets an extra life. The player gets bonus coin multipliers equal to the number of minigames that they win in a row. 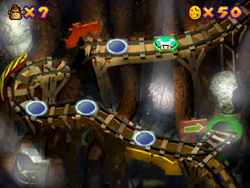 All the 4-player, 1-vs-3, and 2-vs-2 minigames (except for Rainbow Run and Dungeon Dash) are divided into nine worlds, and have to be completed to finish the Mini-Game Coaster. 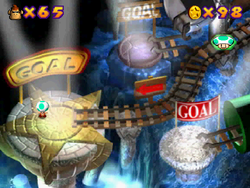 Depending on the difficulty chosen at the start, the player can only progress until a certain point: Easy only goes as far as World 3, Normal ends at World 6, and Hard runs the full course. 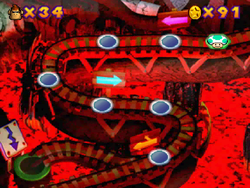 At the end of the game, the player gets bonus coins for the remaining lives and coins, plus 100, or 500, or 1000 additional coins on Easy, Normal, and Hard difficulty, respectively. Beating the Normal course lets the player buy Item minigames, and beating the Hard course lets the player buy Battle minigames. Mini-Game Space - Enter this space to play a minigame. Blue spaces are uncleared spaces and yellow spaces are cleared spaces. Toad Save Space - Appears at the beginning of every world. Here players save their progress. 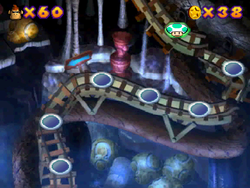 After saving, the Toad in the Goal Star will ask the player to start from world one. No matter which answer is given, another Toad tells them it is a fake and it will transform into three Baby Bowsers. 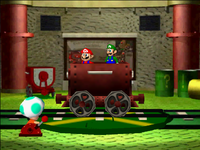 They will challenge the player to a Shell Shocked game. 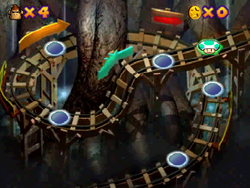 After the Bowser bunch have been defeated, they will run away, and the real Toad that was at the save point will give the player some rewards. This page was last edited on March 19, 2018, at 17:19.